Handles and Hinges:ebony. 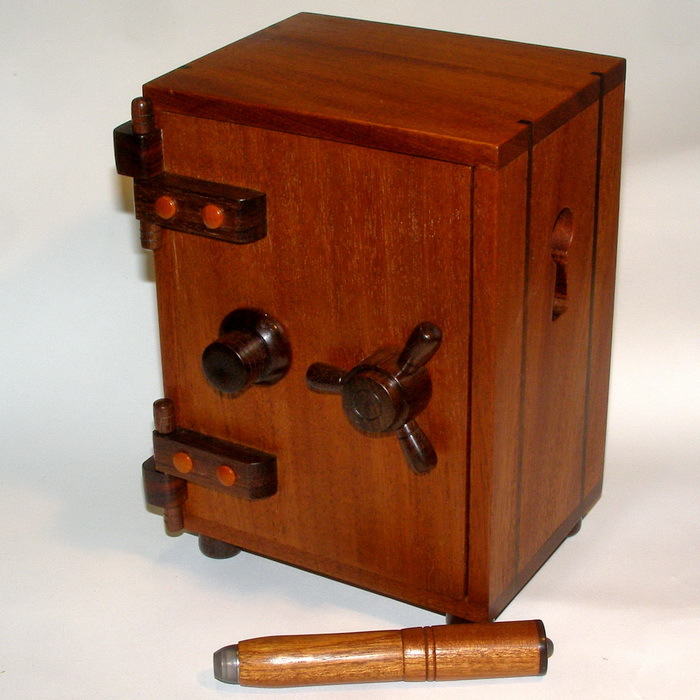 Box and Parts :mahogany,chakte viga. The Goal of the puzzle is to open it and then close it. The large keyholes are there to help you.A small story:I figured that:'' what can you do with a keyhole"" 1)you can look through and 2)put a key. So the key to open the vault is to look through(hence both functions!Now after you open the vault there is another mechanism that prevents the door to close....another puzzle to solve. I was very glad to hear that the Vault puzzle was awarded with the "top ten vote" recognition in International puzzle design competition 2012 (IPP32 DC Washington) So people enjoyed it and gives me courage to make some copies in the future. See more pics of the "vault" puzzle.or Back to puzzle index.